the Vedic personification of Mars. In astrological terms, Mars is a hot, dry, fiery, violent planet. The NASA rover, 'Curiosity' has so far revealed that present day Mars is an arid and barren place, but may have hosted life in the distant past. Mars has an orbit that lasts one year, three hundred and twenty one days and thirty two hours, is exalted at 28 degrees in Capricorn and rules the zodiac signs of Aries and Scorpio. When this planet is nearest the Earth and when it is in retrograde, murders are more frequent, as are natural calamities. An individual with a strong influence of Mars is strong, well set, but short, may have a stern expression and a scar on the head or face. When Mars is favourably aligned in a horoscope, the concerned individual is confident and bold. Such a person may be confrontational, while at the same time may be rational and generous, but may not be very sociable. But when Mars is adversely placed, the native is inclined to violence, quarrels, treachery, robbery, many kinds of wickedness and cruelty. The native may be short-tempered with an inclination to get into quarrels and mischief. Mars governs the parts of the body involving the head, face, stomach, kidneys and knees and also the groin, bladder, reproductive organs, the heart, throat and circulatory system. The diseases caused by this planet are of an inflammatory kind, and those resulting in wounds or burns and blood disorders. Other afflictions are tumours, abscesses, small pox, toothache, headache, diabetes, jaundice, measles, shingles, boils and fevers of all kinds. Mars can be responsible for sudden illnesses and accidents. One must remember that the planet simply represents physical force, and a lot depends on the native to utilise this force in a constructive way. It can give the native vitality, courage and ambition or at the same time make him/her unreasonable, intolerant, impulsive and impatient. Such a person can be extremely sensitive and can take offense easily. They will also take foolhardy risks and may have an antagonistic disposition. Mars sometimes interferes with accomplishment, but with reflection and visualisation, these problems can be overcome. When Mars is dominant, a person may only be happy when they feel they are conquering and overcoming obstacles, but such a person must take time to think out their course and not act on impulse. It is very essential that the native of this planet tempers his anger or resentment with mercy and develops a more sympathetic, tolerant attitude towards the shortcomings of others. Mars rules iron and sharp instruments and persons with a strong influence of this planet make good butchers, barbers, carpenters, metal workers, soldiers, surgeons, chemists and dentists. Such people are also suitable for the armed forces and law enforcement. Mars also governs land, property and real estate, hence a person with a favourable influence of this planet will be able to derive benefit through land, this could be through investing, trading or from land produce in activities such as farming. Mars signifies expanding force, abundance of energy and stamina, courage, ambition, physical strength, youthfulness, anger, wickedness, generosity, impatience, good health, martial forces, self-confidence, practicality and ego. It is the lord of Aries and Scorpio. It is exalted in Capricorn, and debilitated in Cancer. Mars is responsible for diseases such as hypertension, fevers, smallpox and jaundice, malnutrition-related ailments, boils and carbuncles, headaches, private parts and also wounds, burns, accidents and operations. The corresponding colours for Mars are red and orange. 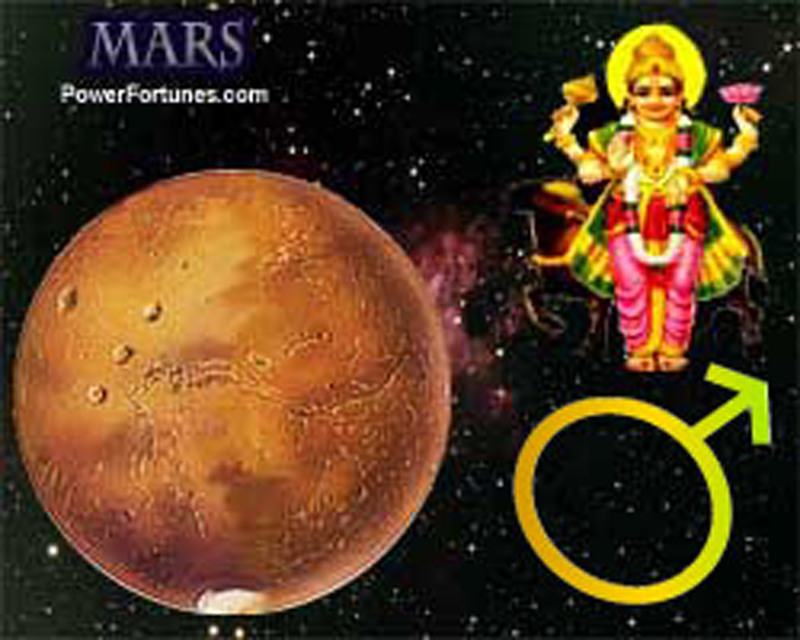 According to numerology, Mars' number is '9'. It is the lord of minerals and summer season and the south direction. It represents gold and red coral is it's corresponding gemstone. It is associated with aggression. The direction associated with Mars is, South. The corresponding talisman for Mars is the 'Mangal Yantra'.